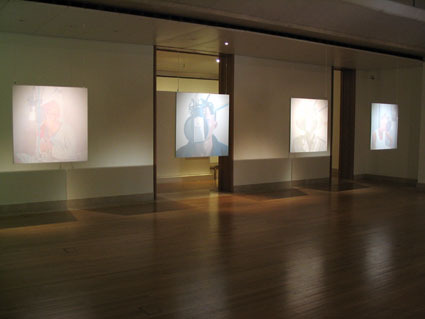 Sound shifts around the room and each portrait, as in a fairy tale, takes its turn at speaking to us. But Wynne underlines the fragility of these languages by only giving occasional glimpses of actual words. The rest of the time we stand amidst a soundscape that he has created from the voices' raw material: clicks are processed to generate bell tones, while vowels are massively extended into shimmering drones. The result is an Ambient music, calm and beautiful, in which we have space to think about the issues underlying the piece; but it's also a simmering, ominous sound which conjures the desert itself. The opening of this installation in Gaborone was delayed because of the Botswana government's sensitivity to issues relating to the Khoi and San peoples, the indigenous inhabitants of southern Africa. Roy Sesana, Chair of the First Peoples of the Kalahari and one of the subjects of my piece, was at the time engaged in a High Court case challenging the legality of the government's forced eviction of the San from land they have occupied for thousands of years in what is now the Central Kalahari Game Reserve. 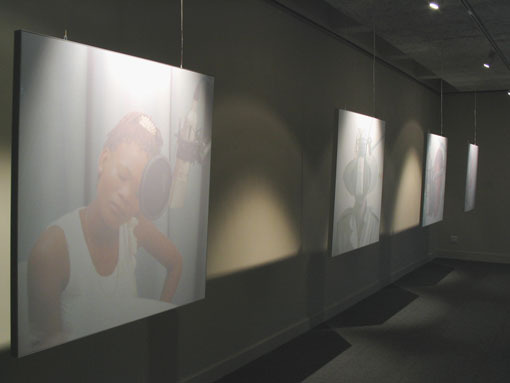 The officials' main concern was with what Roy says about the oppression of San peoples and the threats to their culture and their languages on the CD-ROM I produced (in conjunction with the Hans Rausing Endangered Languages Project) to accompany the exhibition and which I refused to withdraw. The Permanent Secretary finally gave his approval 4 days after the scheduled opening. And Roy and the First People of the Kalahari won their case against the government in 2006. 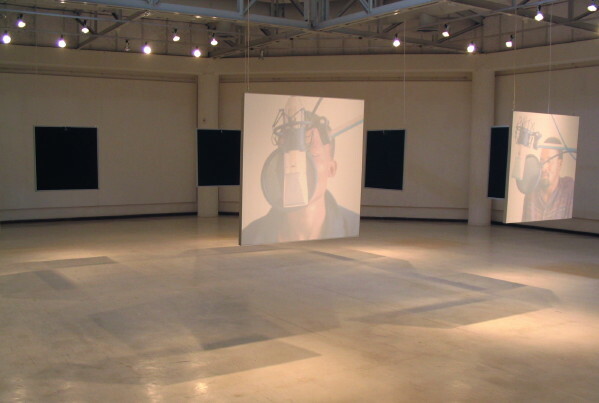 The portraiture integrated into the playback system of this installation counters the shift towards a detachment from human agency, yet also engages with the mediating effects of recording technology. 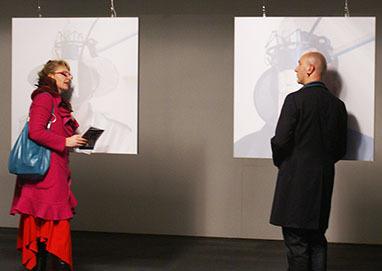 Faces are obscured; voices are extended, or filtered, until their meaning is abstracted. These faces, and voices, are both highlighted by the wider world of digital communications, and with conscious irony, absorbed by its power.